Malaria is a well known disease of humans – once common throughout much of the tropics and subtropics but now still affecting 215 million annually in tropical regions throughout the world. What is less well known is that most, if not all, species of human malaria originated in our non-human primate relatives. Plasmodium falciparum, the species of human malaria that causes the most amount of deaths per year, is the result of cross-species transmission from gorillas. But malaria parasites didn’t only come from non-human primates in the distant past – there have now been two large foci of primate malaria infections in human populations. The first large epidemic of monkey malaria in humans was first identified in Malaysian Borneo in 2004. This parasite, Plasmodium knowlesi, normally infects macaques and leaf monkeys in parts of Southeast Asia, but it is now responsible for the bulk of human malaria in the same regions. A) Long tailed- macaques are natural hosts of Plasmodium knowlesi, an important zoonosis in Southeast Asia. Photo by Andy Dobson. B)In South America, howlers are an important reservoir host for Plasmodium simium, a newly identified zoonotic in Brazil. Photo by Dario Sanchez. 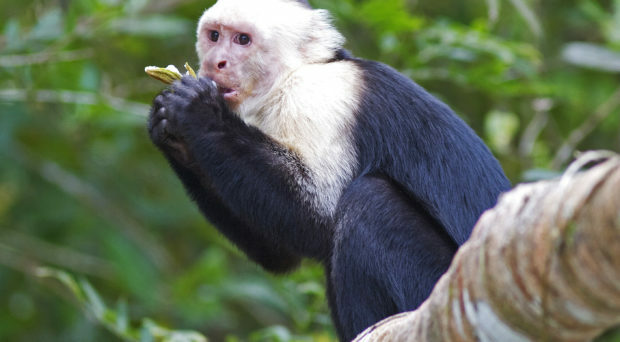 Last month, research in Brazil revealed that humans were infected with Plasmodium simium, a species of malaria that typically is transmitted to howler monkeys and capuchin monkeys in Atlantic Forest of Brazil. The malaria parasite is closely related to the human parasite P. vivax. Malaria was once common in humans in the region, but was eliminated in the 1970s. Patients were presenting to hospitals with vivax-like parasites but they had no history of travel to malaria endemic regions. This led the authors to use a series of molecular techniques to identify the parasite as a monkey malaria. New World monkey malaria likely came from Spanish conquistadors, crossing the species barrier and infecting a wide range of monkeys from the Atlantic forest to Central America. Other papers have suggested that monkey malaria might be infecting humans in frontier regions of South America, but this was the first study to provide concrete evidence. So why is this occurring and why now? In parts of Southeast Asia, emergence of P. knowlesi has been linked to deforestation. Cases of human P. knowlesi are associated with areas where there has been deforestation in the last 5 years but also still have 65% of forest intact. This, combined with genetics, leads us to believe infection is a constant spillover from macaques. Forest is necessary to maintain these populations of macaques and deforestation and changing landscapes facilitates the spillover into humans. Though this doesn’t mean the parasite can’t adapt to spreading from human to human – it has in the past. Map of Rio de Janerio state showing cases of human (red) and monkey (blue) malaria. Many of the infected individuals had entered the Atlantic forest and were located near monkeys that were infected. However, in contrast to Southeast Asia, there has not been major changes to land cover in the region. The authors speculate that an increase in ecotourism and popularity of outdoor activities may be driving increased spillover in Brazil. So a change in land use, rather than land cover may be important in this malaria zoonotic. What does this mean for people in these spillover regions? Control and prevention interventions should focus on minimizing contact with infected vectors and education of risk factors. Other vector-borne zoonotic diseases are important in this region as well – a large sylvatic yellow fever outbreak in 2017 was another reminder of how essential understanding this system is for human health. This latest infection risk emphasizes the importance of an integrated approach to health. Understanding the ecology of vectors (which are not well known in this region) will be essential to understanding and managing risk of this zoonosis. Managing these zoonoses requires an interdisciplinary understanding of the ecology, geography and behaviors underlying these changes in epidemiology.